Though the Commonwealth Bank is facing a civil suit over a number of compliance breaches, its share price is unlikely to be affected. In this piece, John Abernethy explores the drivers behind the bank's performance over the past few years - Brought to you by Clime Asset Management. The revelations that the Commonwealth Bank of Australia (CBA) is being taken to court over alleged AUSTRAC reporting and compliance breaches will overshadow its annual result this week. The action is a civil one and a massive penalty is likely. However, the monetary penalty is unlikely to affect the CBA share price. For instance, a theoretical but massive $1 billion fine is a mere 1/140th of the bank’s market capitalisation and would represent just 1.5 per cent of shareholder equity. Based on the 2017 financial year (FY17) reported net profit of $9.9 billion, it could be paid from bank pre-tax earnings in just one month! Therefore the CBA’s intrinsic valuation will be hardly affected by this event but it may soon become clear that the premium rating by the market for CBA compared to its Australian peers (WBC, ANZ and NAB) must be challenged. The CBA board released a statement whereby it wiped out short-term incentives that may have been payable to key executives for FY17 and declared it will reduce non-executive board fees by 20 per cent in FY18. While this is noble, it hardly addresses the damage done to the reputation of the bank. Further, the “give up” by directors and executives will be dwarfed by the fine that will be borne by shareholders. The CBA board has noted the “risk and reputational issues” that are flowing from the alleged AUSTRAC reporting contraventions. This is important for CBA shareholders to understand because the relative rating of CBA shares on the stock market has consistently been at a premium to its peers. This premium is reflected in a higher multiple of its share price to its net tangible assets (NTA) per share. This rating also reflects years of superior performance in terms of the return on shareholders’ equity. 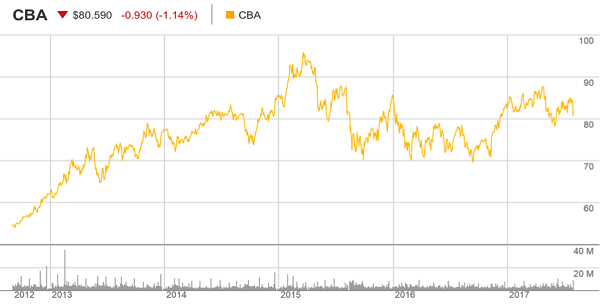 Despite this premium rating, it has not resulted in a superior share price performance by CBA over the last three years. Indeed, the share price today is exactly the same as it was in August 2014. The big banks have been affected by a range of headwinds, but have all benefited from a surge in household debt that has helped grow their balance sheets and profits. CBA has seen a noticeable decline in normalised return on equity, from 29.8 per cent to 21.5 per cent, over five years. This is a measure of profitability and so while profits are rising, the profitability is falling. This is important because it is profitability that mainly determines the multiple of equity (or NTA per share) that a company’s shares trade at. To illustrate this point more clearly, we focus on the incremental returns coming from retained or raised equity. Over the last five years, CBA has grown equity by $18 billion (from $42 billion to $60 billion) and lifted earnings by $1.8 billion (from $7.6 billion to $9.4 billion). The incremental return is thus averaging 10 per cent, or 15 per cent adjusted for franking credits. The incremental returns on equity for CBA are falling and this has dragged down the overall return on equity. While this is concerning, the decline is actually more acute because of the massive amount of hybrid equity raised over the last five years. These $5 billion of hybrid raisings have helped CBA (and all major banks) to meet the more stringent risk-adjusted capital ratio requirements set by APRA. However, while it is adding to tier 1 capital, it is generating a low return for the banks after the servicing of dividends to the hybrid owners. While CBA is an exceptional bank, it has clearly benefited (like all the Australian banks) from an extraordinarily prolonged period of sustained economic growth, significant household debt creation and arguably lax capital regulation. The sustained growth period has meant that the last 20 years have been a benign period for bad debts for Australian banks. 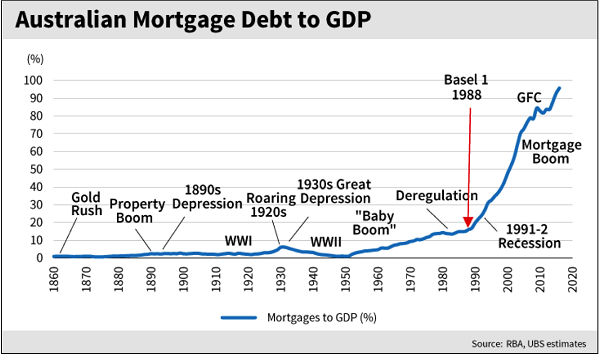 This remarkable period of super-charged debt creation is shown in the following chart. The banks grew their mortgage loan books funded by cheap deposits and equity grown via a range of hybrid capital raisings that super-charged the returns on ordinary equity. Arguably, there was no better bank at achieving this outcome than CBA. The growth in bank balance sheets over the last 20 years directly reflects the growth in household leverage; it is well documented that today, over 80 per cent of new loans written by banks are mortgage debt related. It seems that the CBA (like its peers) has taken on the appearance of large building societies. They have done so with an excessive focus on asset growth that clearly benefited executive bonus payments. After a long period of excessive market price to intrinsic value observations, we now see the share price correctly reflecting the lower return on equity. Subject to further negative news flow, CBA shares will start to look interesting at about $76 (ex dividend) or at a 10 per cent discount to 2018 value. We believe that the years of frantic loan growth and under-capitalised balance sheets are behind CBA. However, these same observations hold true for all the major banks. So while the CBA has created its own unique set of problems, we perceive that slower asset growth, lower ROEs and higher retained earnings will be a common feature of all banks in the next few years. What is unknown is the work-through of the excessive level of household debt that prevails across the Australian economy and within bank balance sheets. So long as bad debts don’t rise, the banks will drift through this cycle; but any significant lift in interest rates or unexpected “black swan” international event could have serious consequences. Indeed, more serious than those proposed for senior CBA executives. 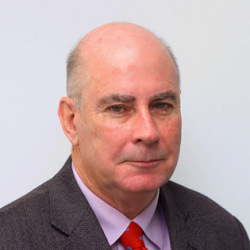 John Abernethy is the managing director and chief investment officer of the Clime Group.